We were happy to wake up to sun this morning. It is a long ride to Radium. 76 miles with a few thousand feet of climbing. 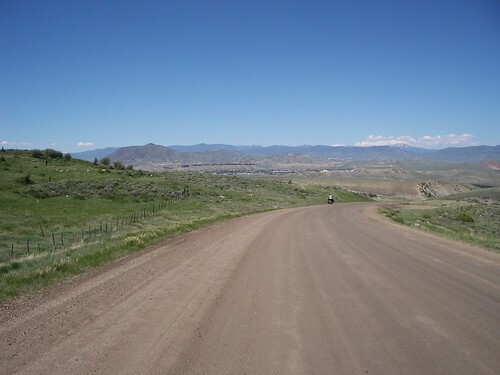 It is too much for me to handle, so I decided to replace 40 of the first unpaved miles with the more direct CO Highway 9. Mathieu and Auke will stay on the main route and we plan to meet where the routes intersect. 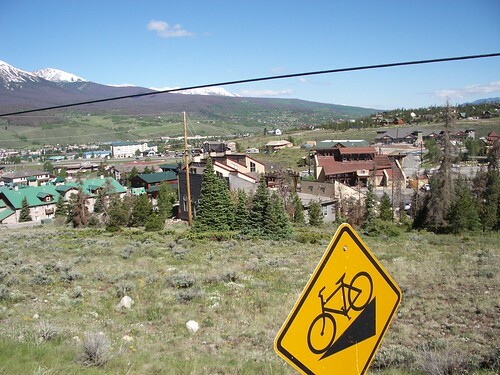 From town, we continued north on the bike path to Silverthorne. 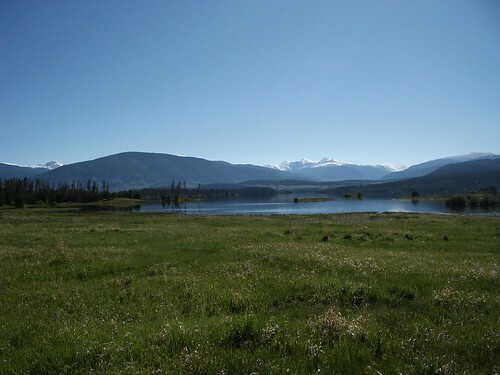 Clear skies, cool temps, and spectacular views of surrounding peaks the Dillon Reservoir made riding fun and easy. Even after we turned off the bike path onto highway 9, it was enjoyable – we had good shoulders and a slight downhill. 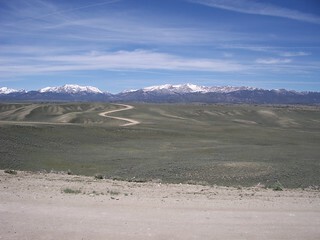 We regrouped after 13 miles on the highway – I go straight on pavement; they turn east and off road. Mathieu mentioned knee pain and did not want do to the off road section. So we all went straight on the highway. Unfortunately, at this point the shoulder went from four feet to three inches and we had to deal with RV’s, 18-wheelers, and fast traffic. A few miles ahead, the road forked. We could bypass a busy/narrow section with a quieter (yet longer) detour to the town of Heeney. After a short sprint to the fork, we rode more relaxed on the quiet detour. 4 miles passed before a construction truck pulled up. The driver said the road was closed ahead and they wouldn’t stop work to let us through. I was frustrated for having to backtrack – especially to a busy road. I wanted to see if I could get through the construction, but the others decided to turn back. If I was denied at the road block, I’d be an extra half hour behind. Backtracking seemed to go slower than the first time riding the road. Probably because I was frustrated. The busy/narrow section was just as bad as I imagined – cars passing close at high speed and no shoulder. There were a few short climbs that unnerved me. When climbing, I tend to swerve to keep my balance. I was very tense whenever cars passed during these sections. The traffic eventually lessened, but shoulders never returned. The roads were just windy/hilly enough to block sight of Mathieu and Auke, who were in their usual position…ahead of me. Noon passed and I was hungry. We were supposed to eat in Heeney, but missed it due to construction. I had no idea where or when the others would stop for food. So I became increasingly exhausted and frustrated. At 2:00, having ridden 55 miles, I finally caught up with Mathieu and Auke. We sat on hot, glass-covered dirt next to the highway where we were to continue off-road. Mathieu’s bike was producing high-pitched squeaking noises, so he rode to Kremling to have it checked. Depending on whether it was a quick fix or not, he would meet Auke and me in Radium tonight or Steamboat Springs tomorrow. Just after lunch, Auke & I crossed over a large river – I was low on water, but didn’t bother stopping to filter some. I thought after one climb it was a long descent into Radium (which is on the Colorado River). Before the top of the climb, I had sucked my camelback dry and drank half of my reserve water bottle. 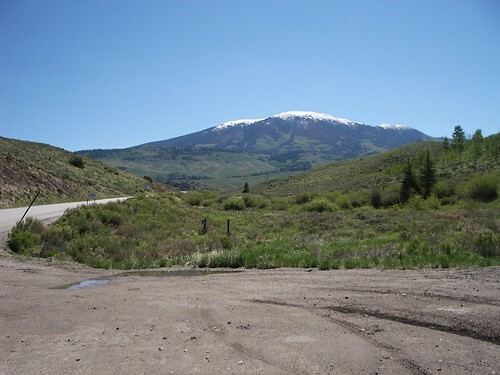 At the top, I found a house next to a rafting company’s “base camp.” I pulled into what could be called a driveway and greeted a buy outside the house. He happily let me fill up my camelback. I was not the first GD rider to stop there – one of the unicyclists who did the ride a few years back stopped there as well. This guy – Dave was his name – was the third person to mention meeting the unicyclists. Full on water, I left and descended. The CO River came into view as I rounded Inspiration Point. The fast (probably too fast) descent ended quickly with a steep uphill. I thought after one climb, it was entirely downhill to Radium…wrong! I was mentally and physically drained & made slow progress up this unexpected climb. I’m glad I refilled my water at Dave’s – I drank much of it by the time I descended again. A mile before Radium, I passed a dispersed campsite – no sign of Auke, so I rode on to the Radium Campground. He wasn’t there either. Certainly, Auke was ahead of me – but not where I thought we were meeting. Maybe he took a wrong turn somewhere and would catch up? I finished setting up camp and Auke was still MIA and I wasn’t sure if Mathieu would arrive tonight. I decided to check back at the dispersed site for Auke. He was there! Even when I rode past the first time, he was already there – probably just out of sight. He had eaten, but not set up his tent, so it wasn’t a problem to relocate to the campground I was at. Back at the campsite, I decided to go for a swim in the Colorado River. It was less swimming than acclimating to the frigid water. As I was wading, Mathieu arrived. A watchmaker in Kremmling disassembled and greased Mathieu’s rear cassette – which seemed to stop the noise. As the sun set & mosquitoes came out, I dried off and took refuge in my tent. Tomorrow, we should arrive in Steamboat and stay for a rest day. It’ll be a difficult day, though. 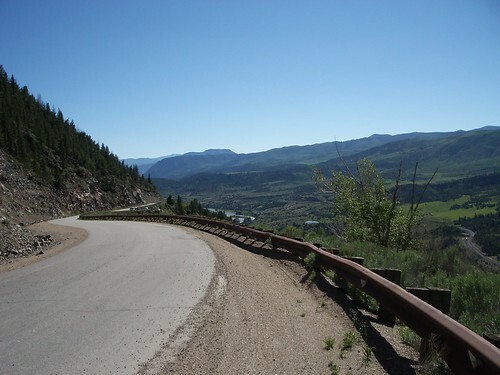 We have a climb out of Radium that past northbounders have identified as one of the toughest climbs on the route. This entry was posted in Journal on November 21, 2010 by dave.